"Thank you for choosing Closet Works! As an artistic, creative person, I have always had a passion for all aspects of design. Space planning is my specialty, and in the best design, form follows function. Having worked in the design industry for years, I am passionate about creating a unique, beautiful, useful and personal space for each client. From the most basic design to incredibly elaborate, I am very detail oriented and dedicated to providing you, the client, with the best possible design, customer service, and product. On behalf of Closet Works, I look forward to meeting with you and greatly improving your storage space needs!" 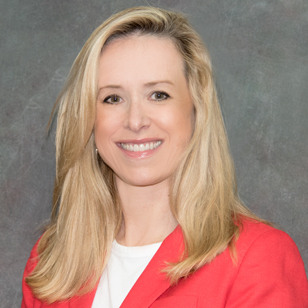 As an incredibly talented designer with great listening skills and a passion for space management, Molly Anderson provides every customer with a rewarding and satisfying experience. Her commitment to the clients and their needs ensures that every project will be a winner, meeting or exceeding your expectations in every way. 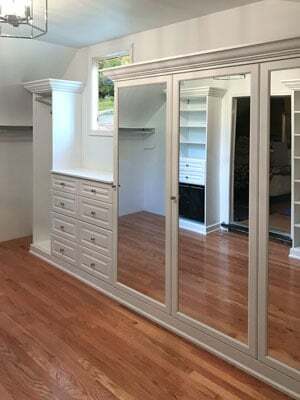 This closet/dressing room was part of a historic home renovation. A large addition to the back and side of the house allowed the owners to gain a 4-car attached garage and extra space for an enlarged kitchen, master bedroom, bathroom and storage. 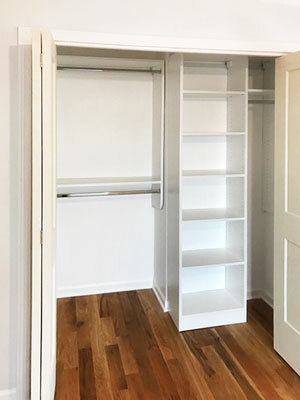 This closet is located behind the kitchen and off the master bathroom, which you must pass through in order to get to the space. 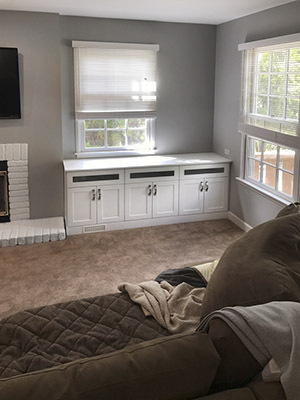 The owners wanted to maintain the elegant traditional feel of their home, while updating it to suit their contemporary lifestyle and modern aesthetic. 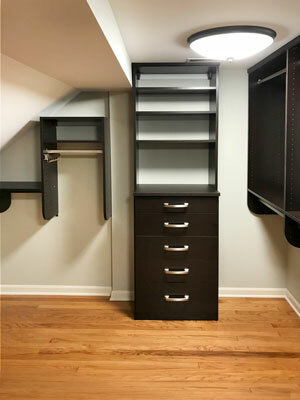 The opposite end of this closet offers an elegant way to organize and illuminate prized accessories and shoes. The unit is a combination of suspended and floor-based and provides adjustable shelving to accommodate the different heights of the shoes. The system is lit by warm LED strip lighting. This timeless design captures the geometry of the room and utilizes each angle to its fullest potential with each of its organizational assets — including hanging rods, separate shelving units, drawer space, and a window hutch. 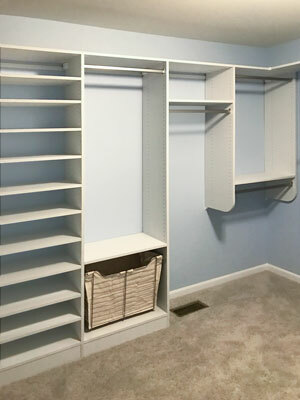 Clothing rods sit below steep slopes offering plenty of space for hanging medium length blouses and pants while leaving access to the knee room. A wall unit provides a Synergy tilt hamper to keep clothing clutter at bay. Each shelving unit in this design fits proportionally in the space even leaving overhead storage space for boxes and luggage. Shoes and folded items can be neatly stored on these spacious shelves with elegant traditional crown moulding. This closet is a organizational dream come true with traditional elegance. The design is in a classic white with a sophisticated Shoe Spinner to maximize corner storage. The design also has mirror inserts with open frame Tuscany fronts. Shelving and hanging are all around to get the most organization out of this compact space. 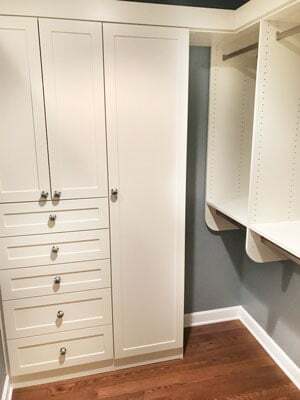 Presenting the challenge of a jutting wall, Molly designed this reach-in guest closet in the best possible way to maximize and make efficient use of the space. Against the protruding section, a section of shelves was placed for optimal hanging and shoe storage. 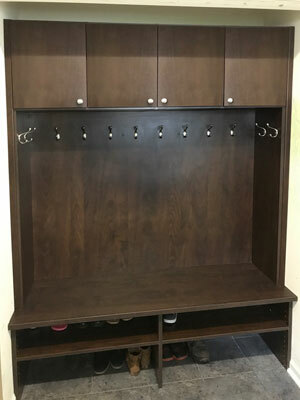 In this unique laminate, this closet is presented as a blank canvas ready to be painted by clothing. This is a mixed system — hanging rods are suspended and a closet dresser hutch is floor-based creating a dynamic layout. The dynamism is fuctional for an extensive wardrobe, providing double hang, long hang, shelf space, drawer storage, and closet accessories. Below the long hang compartment, a canvas lined laundry basket is built into the system, eliminating the need for a bulky laundry basket to take up valuable closet space. An expansive collection of shoes can be stored on the adjustable shelves. 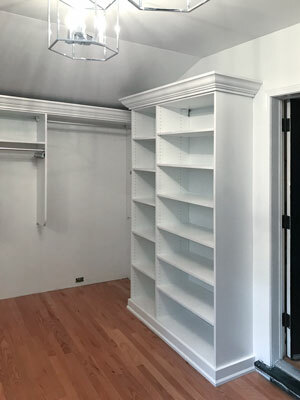 As a display of precision and perfection, this sloped ceiling closet design in Libretti maximizes storage on every angle. 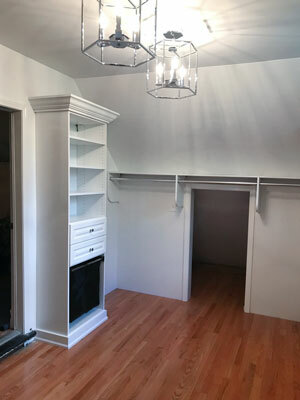 With components reaching floor-to-ceiling and leaving clear access to the air vent, the closet not only looks sharp but pays complete attention to all features of the room. As a simple arrangement, this walk in closet has a rich profundity with its design details. In a Cocoa Bean laminate with brushed chrome Emerald knobs and Villa drawer faces, the closet has an elegant charm. 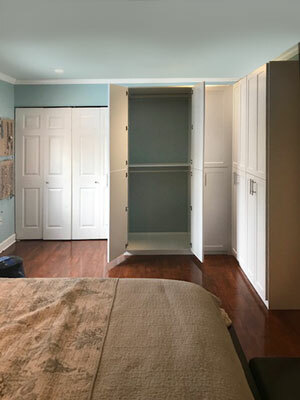 As a suspended system, this walk in closet offers plenty of organizational benefits on top of being a beautiful design. 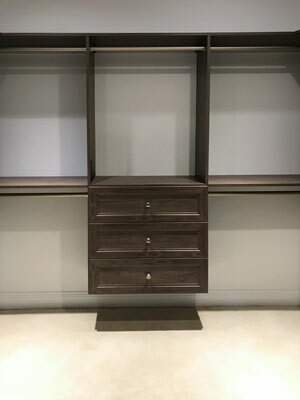 The quality design offers spacious hanging compartments and a built in dresser for folded items and undergarments. The design leaves overhead and storage below for boxes and luggage. This mixed floorbased and suspended system is in an elegant ivory — a softer option than white to offset the contrast against the deep blue walls. 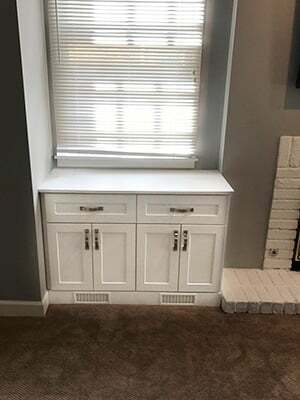 The organization system is outfitted with customer supplied hardware, displaying how Closet Works can accommodate your visions for your storage system. 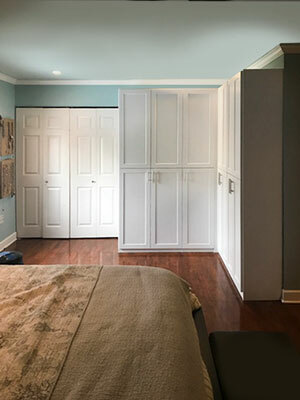 As a way to increase storage space, this elegant wardrobe was built along two walls adjacent to the bedroom's reach in closet. 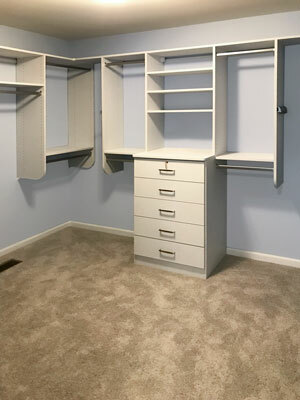 This bedroom wardrobe provides additional storage space not offered by the reach in and does so in an elegant fashion. Shaker Mission doors are doweled together for a clean aesthetic with modern brushed chrome Bar handles. 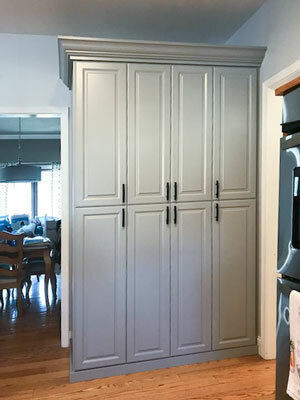 The doweled doors open up to reveal expansive double hang storage. 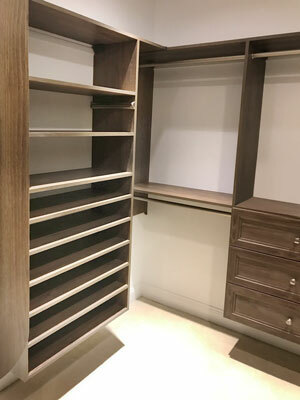 The interior of this wardrobe also includes varied shelf heights for shoe storage — including a taller section at the bottom just for boots! With a clean and sharp aesthetic, this wall unit adds a stylish and modern flair to the room. The design is not only attractive, but it is thoughtfully customized to adapt to the features in this location of the room. Ventilation remains available by a vent grill included in the base molding. The height of the unit is perfect for access to the the electrical outlet on the wall. Flip down doors are a unique feature provided to keep electronics in sight, yet conceal chaos of wires. The glass inserts enhance the overall look and a great way to show off equipment without too much overtness. This side reflects the stunning features of the opposing unit sans glass inserts. The vent grills blend into the base molding providing access to the home's air system. 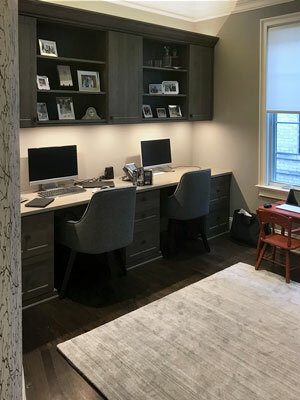 This home office design has transformed the space into an expansive, light-up luxurious workspace. A strip of light is emitted from the top creating an awe-inspiring atmosphere. The spacious countertop is Silestone Coral Clay gently illuminated by warm LED puck lights. The wall unit and desk are created in a dark, intriguing Blackwood laminate. 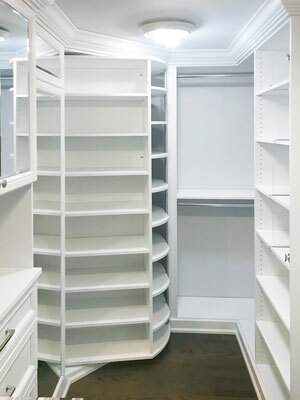 This kitchen pantry design was created as a separate pantry closet for increased kitchen storage in the home. This addition is in a calming Rain Cloud laminate with raised Harmony fronts for a transitional look that blends well with most home decor. 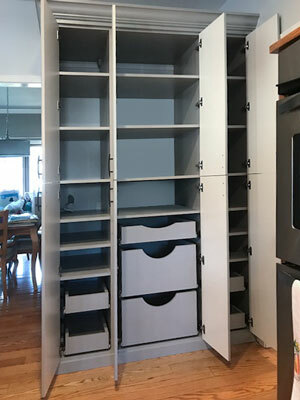 The inside of this pantry offers incredible storage with its details which include scalloped pull-outs, slide-out shelves, and plenty of additional shelving. The unit has also been outfitted to accommodate electrical wiring — leaving clear access to the outlet and power switch. 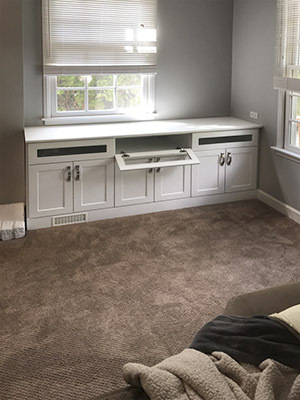 As an elegant pairing, Round knobs with Cocoa laminate create a unique, contemporary look for this simple, yet sophisticated mudroom. This organization provides plenty of hooks for all outerwear and bags with room to spare! Shelves below offer a place to keep shoes neat and organized.